Schrödinger's cat is a thought experiment, usually described as a paradox. Seals Red, Blue or Green? Back (1) – This is the preferred term for the reverse side of a paper note. Back Plate Number (2) – A small number found at the lower right of the Back of a bill; officially known as a Check Number. 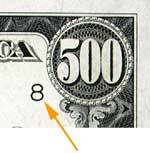 This number provides a cross-reference to the Plate Serial Number on the front of the bill. Bank Note – A piece of paper currency issued by a bank, rather than the federal government. 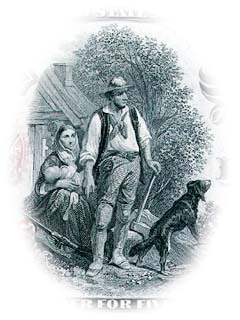 BEP – The Bureau of Engraving and Printing, established in the early days of the Civil War and formally recognized in 1869. Since 1887 it has printed all paper currency for the United States. Over its history, the BEP has also printed U.S. postage and revenue stamps, treasury bonds and food coupons. Border (3) – The outer edge of the design on either the Face or Back of a note where the design ends and the plain currency paper outer margin begins. Brick – A unit of measurement used by the BEP for paper money. A strap is 100 notes banded together; forty straps are packaged together to make a Brick, consisting of 4,000 notes and weighing about 8 ½ pounds. Broken Bank Note – Paper money issued by a now-defunct bank that has failed; may also be referred to as an Obsolete bank note. Check Number (2) – A small number found at the lower right of the Back of a note, used to cross-reference with plate numbers on the front of the note. Check Number is the correct term for Back Plate Number. Condition – The grade or state of preservation of a piece of paper currency. Continental Currency – Paper money first issued in 1775 by the Continental Congress to finance the Revolutionary War; originally backed by Spanish milled dollars, Continental Currency eventually depreciated to the point of near-worthlessness. Counterfeit – Paper currency specifically created to look just like genuine currency, made with the intent to defraud. Currency – Refers to legal tender; usually used for paper money only, but does apply to both coins and notes. Denomination (4) – The face value or amount of money a coin or note is worth. District Number (5) – The Federal Reserve District Number appears four times on the Face of a bill for identification purposes and corresponds with the letter in the District Seal to designate the Federal Reserve Bank that issued the note. Engraving – A labor-intensive process done by highly skilled employees of the BEP. The finely detailed design is engraved onto a steel printing plate with a tool called a graver. Error Note – A piece of currency that has a manufacturing mistake or a misprint; usually caught and destroyed by the BEP before it enters circulation. Face (6) – This is the preferred term for the front side of a paper note. Federal Reserve Bank Note – A series of U.S. paper money once authorized by the Federal Reserve, now obsolete; not to be confused with Federal Reserve Note. The Federal Reserve Bank that issued the note, not the Federal Reserve System, was obligated to honor this note. Federal Reserve District Seal (7) – Found to the left of the portrait on the Face of a note, the seal identifies the Federal Reserve Bank (there are 12) that issued the note. Federal Reserve Note – The only form of paper money presently being printed in the United States; not to be confused with Federal Reserve Bank Note. The Federal Reserve System is obligated to honor this note, not the bank that released it into circulation. Gold Certificate – A form of U.S. paper money redeemable for gold coin at one time. Illegal to own between 1933 and 1964, they now are honored at banks, but can’t be redeemed for gold coin. Highly prized by collectors. Grade – The condition or state of preservation of a piece of paper currency. Great Seal (8) – Established as the national emblem in 1782, it first appeared on U.S. paper money in 1907; since 1935 it has been part of the Back design of the $1 bill. On the obverse of the seal, the American eagle holds olive branches in its right talon and arrows in its left, under 13 stars for the original colonies. On the seal’s reverse, a broken pyramid signifies strength, with room to expand. Greenback – Originally known as a Demand Note. Issued in 1861, it was the first note to have a green reverse or Back, establishing a tradition that exists today. Green ink was originally used as an anti-counterfeiting measure, because early cameras and film could not reproduce it. Today, Greenback is a common term for any U.S. paper currency. Horseblanket – A popular nickname for U.S. large-size notes. Large Size – Refers to U.S. paper money that measures 7 3/8" x 3 1/8", issued 1861 to 1928. Legal Tender (or United States) Note – The longest-lived type of U.S. paper money, Legal Tender was authorized by the U.S. Government in 1862 and last issued in 1969. Micro-Printing – The tiny printing (letters can be six to seven thousandths of an inch high) found in various areas of some U.S. paper currency. Since most photocopiers and scanners cannot capture such small detail, this is an effective anti-counterfeiting measure. National Bank Note – Also known as National Currency. Most extensive paper money series in the nation, issued by government chartered national banks in the U.S. from 1863 to 1935 and secured by government bonds. National Motto – "In God We Trust," the national motto of the United States; added to the Back of paper currency in 1957. Obligation (9) – Legal Tender issued by the federal government is a promissory note; the government is required, or obligated, to honor it as legal currency. The actual written obligation (current notes state "This Note is Legal Tender For All Debts, Public and Private") appears on each note. The location and wording varies by series and type. Obsolete – Paper money issued prior to 1865; often used interchangeably with Broken Bank Note; however, many banks that issued notes became National Banks or liquidated (obsolete banks) but did not fail (broken banks). Obverse – The front side of paper money; the preferred term is Face. 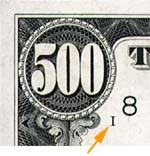 The Plate Position Number or Check Letter is represented on this $500 bill by the letter "I"
Plate Position Number (10) – Also called the Check Letter, it’s the small capital letter (and sometimes number) that appears in the upper left corner of a note indicating the specific location of this note on the printing plate. Plate Serial Number (16) – The small number at the lower right of a note’s Face; identifies the Printing Plate from which the note was produced. Portrait (11) – Artwork depicting a real or fictional person on currency. Beginning in 1929, the U.S. government instituted a system of standardized portraits of notable Americans on specific denominations. Portraits were difficult to reproduce and readily identifiable to the public, making them effective anti-counterfeiting measures. Press – Machinery on which paper currency is printed; printing is done on high-speed presses in secured plants. Printing Plate – A sheet of steel upon which the engraver etches the note design. The plate is positioned on a Press and each sheet of paper is forced into the fine lines of the plate to transfer ink. Reverse – The back side of paper money; the preferred term is Back. Security Thread – An anti-counterfeiting measure; a polymer strip is embedded in the currency paper and is visible when the note is held up to bright light. The thread glows red when exposed to ultraviolet light, and cannot be reproduced by photocopiers or scanners. 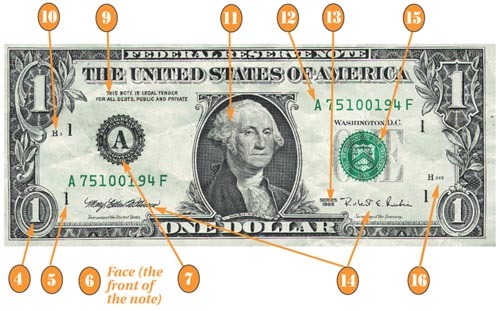 Serial Number (12) – Identifying number on the Face of a note. Used primarily to thwart counterfeiters, serial numbering also allows the Treasury Department to track production. Series Date (13) – Each note is dated the year its series was authorized or first issued. Unlike coins that bear the year they were minted, paper currency carries the series start date throughout its lifespan. To determine the year the note was printed, the Treasury officials’ signatures on the Face must be cross-referenced with their dates in office. Shinplasters – Continental Currency became nearly worthless during the Revolutionary War; it actually had more value as bandages. Soldiers wet the notes and plastered them together to cover their leg wounds. Signature (14) – U.S. paper money issues are promissory notes, currently signed by the Treasurer of the United States and the Secretary of the Treasury. Notes were hand-signed until 1863, then facsimiles of signatures were printed directly on the notes. National Bank Notes required four signatures. Silver Certificate – Authorized by the U.S. government in 1878, it is the second longest-lived paper money series. Once redeemable for silver coins or silver bullion, it is still considered legal tender at face value but is no longer redeemable for silver. Small Size – Refers to modern U.S. paper currency that measures 6 1/8" x 2 5/8", first issued in 1929. The star at the beginning of the serial number on a Star Note. 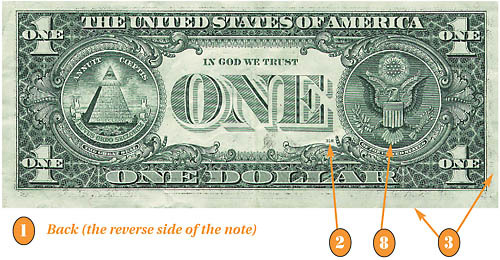 Star Note – Also known as replacement note. A five-pointed star was first used to mark the end of a serial number; later it was positioned at the beginning or end of the serial number to replace large-size damaged or error notes from 1910 through 1929. Beginning in 1935 and ending in the 1980s, the solid star also represented the 100 millionth note produced, as BEP numbering machines could only print eight digits. Syngraphics – A word coined in 1974 to denote the study and collecting of paper money; based on the Latin word syngrapha, meaning a written promise to pay. Treasury Note – Also known as a coin note. First issued in 1890, Treasury Notes were redeemable for gold and silver coins. Treasury Seal shown here in green behind the 500. Treasury Seal (15) – An emblem of the United States Treasury, a symbol that this currency is legally produced; printed on all notes, except for some Fractional Currency and the Demand Notes of 1861. Vignette – The picture on a note that gradually fades into the surrounding background rather than being enclosed within a frame or outlines. Watermark – An embedded design created by varying the density and thickness of the paper; the Watermark can be seen when held up to light. Because it is part of the paper and cannot be reproduced by copiers or scanners, the Watermark is an effective anti-counterfeiting measure. Though used in currency world-wide for many years, the Watermark’s first U.S. appearance is on the newly-designed Series 1996 Franklin $100 Federal Reserve Note. The first coin authorized by the new United States Congress was a one-cent coin. Because there was not yet a government mint, more than one version of the coin was struck. The design (believed to be suggested by Franklin) shows the sun and a sundial on the obverse, with the words FUGIO and the date 1787. Centered on the reverse is the motto WE ARE ONE, surrounded by the words UNITED STATES and ringed by a chain with 13 links. The 1943 steel cent, also known as a steelie, was a variety of the U.S. one-cent coin which was struck in steel due to wartime shortages of copper. Due to wartime needs of copper for use in ammunition and other military equipment during World War II, the US Mint researched various ways to limit dependence and meet conservation goals on copper usage. When the price of copper rose in 1982, the mint was forced to make a midyear change from solid bronze (about 97% copper) to copper-plated zinc. You can find cents dated 1982 made out of both metals. The only way to reliably tell them apart is to weigh them on a sensitive scale. Copper cents weigh 3.11 gm, zinc ones are 2.5 gm. The last copper penny was minted in Denver on October 22, 1982.